For mission-critical facilities like data centers, there is zero toleration flooring failures or other hazards. 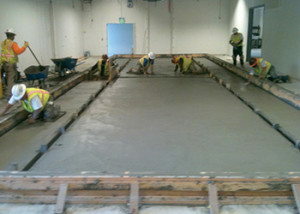 Excess moisture in a concrete slab can destroy flooring after installation if not properly controlled during construction. Rapid-drying concrete eliminates the need for add-on moisture mitigation solutions and dramatically reduces moisture in concrete slabs. Not only is the moisture issue cured at the source, construction timelines for facilities are accelerated. Because technology can change quickly in the high tech manufacturing industry, the owner was interested in a solution that did not need to be re-installed if they required an upgrade to the space in the future. The superior structural performance of ARIDUS® concrete allowed XL Construction to erect steal in 1 ½ days, reducing the construction schedule by about 10 days. Since ARIDUS® concrete was the moisture mitigation strategy, the flooring installer was able to install the flooring without any additional flooring preparations. This resulted in additional schedule savings. Placing, finishing, and joining operations were conducted like any other normal slab-on-ground construction.